Marinate pork with turmeric powder, salt and vinegar. Add 1 ½ cups of water to pork and cook it in a pressure cooker till you hear 4-5 whistles. In a pan, add 2-3 tsp of oil. Add onion and sauté till it turns golden brown. To this add green chilies, ginger, garlic and tomato. Sauté well. Now add all the dry curry powders (turmeric, coriander, garam masala, and pepper), cumin seeds and a little amount of water. Sauté again. 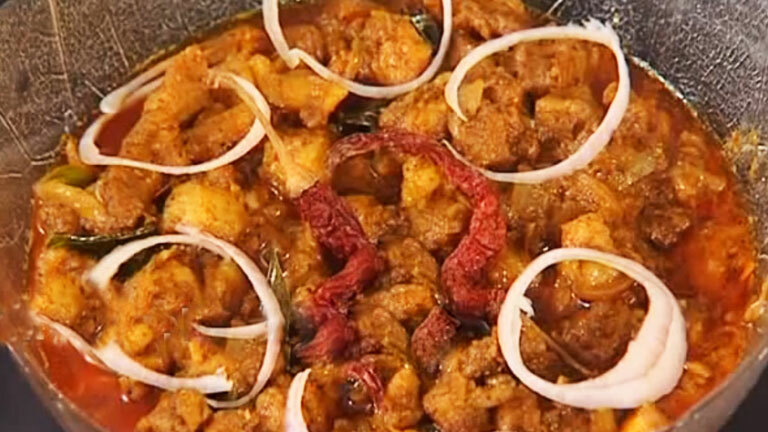 When the oil floats on the top, add cooked pork and mix till the masala combines well with the pork. Close the lid and cook again. Do sauté in between. Add coriander leaves and curry leaves. Mix well and remove from the flame.